For generations holidaymakers and the residents of Worthing have taken much delight in visiting Worthing Pier. The stunning pier was officially opened on 1862 and over many years has been rebuilt and renovated. From the beginning the pier was a huge success but disaster struck in 1913 when gale force winds caused considerable damage. It wasn’t until a year later that the repair work began and the Pier was reopened by the Mayor of London. Disaster has struck again several times since but the Pier lives on and continues be enjoyed by visitors all around. The Southern Pavilion at the end of the Pier, has very recently undergone a complete refurbishment to restore it to it’s original Art Deco glory days from the 1930’s and has now become a beautiful place to hold weddings. With the installation of magnificent crystal chandeliers, oak wood floors and renovation work of the buildings original features, the venue offers lovely natural light and fantastic panoramic views of the south coast. Having just moved to Worthing this year I absolutely love it here and visit the pier regularly with my family and friends. 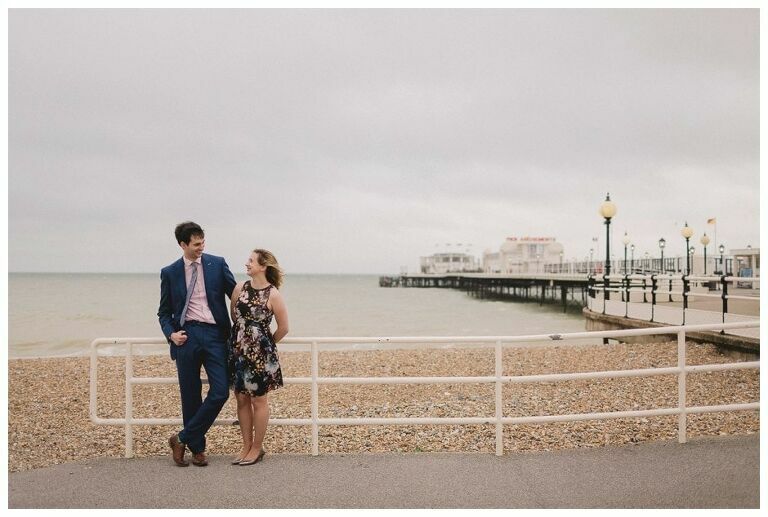 I was delighted when Adele and Jamie asked me to shoot their engagement couple shoot here in June and although it was a very windy day this didn’t stop us from making the most of the pier to get some wonderful images. I really enjoyed working with this fantastic couple and they were very natural and relaxed in front of the camera. Here are a selection of images from the evening and I can’t wait to do more shoots and weddings here in the near future.